People get real amped up about fall & all the fall things. Beers get more hoppy, everything is pumpkin flavored & bikinis are traded for beanies. 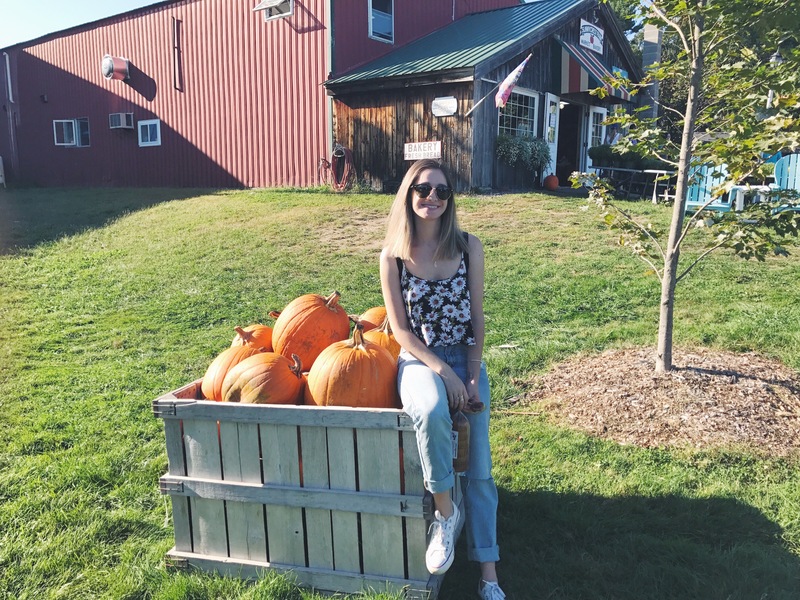 There are so many fun things to do in the fall & today I wanna share some of the things I like to do. Plus, I really wanna know what you guys like to do as well! Here’s 5 things to do when autumn rolls around. I know this has turned into the most basic activity ever, but I’ve been going with my family every year since I can remember. I love having fresh apples to make applesauce & apple crisp. Nothing quite like a warm bowl of apple crisp topped with a scoop of vanilla ice cream! Plus picking the apples is kinda fun & the place we went this year even had goats to pet. Which also means you get to bake & eat the pumpkin seeds! You can get creative painting your pumpkin if you’re not good at carving, or want a quick activity that’s a bit easier. Carving is cool because you get to put that little tea light inside and use your pumpkin as a spooky decoration on your doorstep. Here in New England it’s a great time to get outside and go for a hike. It’s not too hot, it’s not too cold & the leaves are changing, which makes for gorgeous views when you get to the top. You could even bring your gross pumpkin beer to drink when you reach the top! Bring a friend, bring your dog, get outside. Whether you wanna host your own, or go to a haunted attraction, a haunted house is a great thing to do in the fall! I definitely recommend going with a group of friends so that it doesn’t feel so scary, or so that you can scare each other worse, whatever ya like to do. A haunted house is a damn good way to get into the spooky holiday spirit if you ask me. I’ve actually never done this, but I really wanna try it! This is definitely on my list of things to try this fall. Sipping apple cider and figuring out a maze while breathing in the fresh autumn air sounds pretty good to me. If you’ve been, let me know if it’s fun & if I should give it a try! Obviously there are so many more activities to do in the fall, so in da comments, tell me your favorite autumnal activity! Haunted hause idea is great, I did it before… the others are awesome too!